Customize the Purple Chevron Personalized 2” Camera Strap with designs, names, initials and company names to make it personal to you or for your company branding. Instead of using the camera strap that came with the camera which features the camera brand and does not benefit you as your own brand, customize a camera strap of your own so you can work whilst advertising your own business or simply have a stylish personalized camera strap when your travelling. 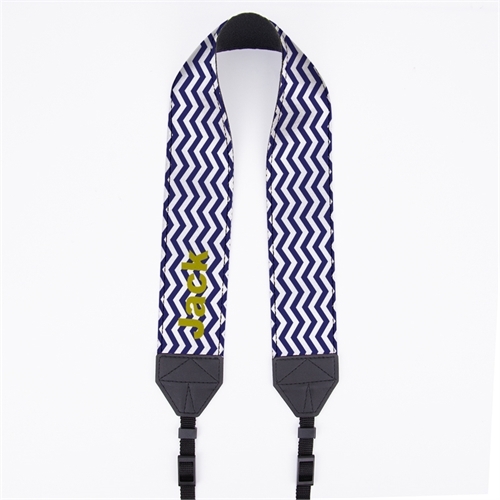 The custom shoulder camera strap features a lovely purple chevron design which can be personalized with a name, initials or company name to make it more unique to you or your company. the custom camera strap is made of top quality fabric material with professional full color printing and strong leather material to help your camera and strap sit comfortable on your neck or shoulders when your taking photos. The personalized camera strap can be easily attached via the straps which can be tied in the loops on the side of your camera. We have no minimum so you can order in bulk or as little as one custom camera strap if required.